Stella Rosa produces two of America's favorite semi-sweet, lightly carbonated wines. 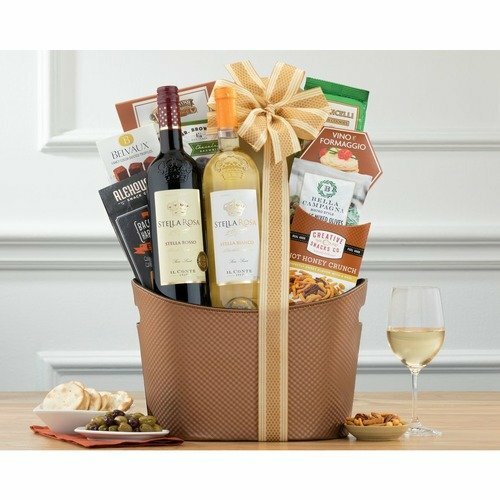 This basket includes rosso red wine with sweet strawberry flavors, and moscato-based bianco white wine with peach and honey flavors. 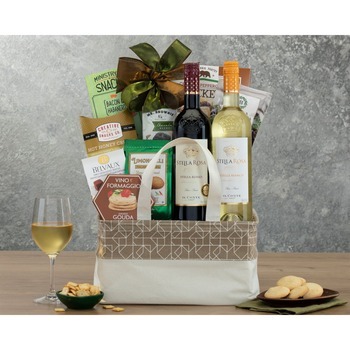 Cranberry and sesame cookies, hummus, olive crackers, Maxim's milk chocolate covered hazelnuts, mixed olives, bread sticks and Italian milk chocolates round out this wine gift basket. Brought to you from a tiny town in northern Italy where everyone is drinking smooth, sweeter sparkling wines.